Close to everything, yet far from ordinary! Camden Manor Park's studio, 1, 2, and 3 bedroom apartment homes are ideally located just minutes from Downtown Raleigh, Crabtree Valley Mall, North Hills and Cameron Village, placing the best dining, retail, and entertainment at your fingertips. Yet you will find it hard to leave home because our stellar amenities package offers everything you need. Select apartment homes offer luxury upgrades such as contemporary white cabinetry, quartz countertops, glass tile backsplash, wood-style plank flooring and stainless steel appliances. Ask us about our available apartments today! Experience a lifestyle where convenience isn't just a luxury, it's the everyday! Drop the costly gym membership and choose between two fitness centers onsite, one fitness center is outfitted with equipment for all types of workouts, endurance training and free weights. The second fitness center is your cardio workout destination - the cardio room is complete with stationary bikes, treadmills, a flat-screen TV, another set of free weights and more. Whether you like to go for a swim or just take in the sun, we have two swimming pools with sun decks to choose from as well. There's plenty of places to share a meal with your favorite people depending on your mood - take in the beautiful Raleigh sunshine in the gazebos and grilling stations or visit the outdoor fireplace with entertainment seating. Our community center is available to rent out for private parties with a full kitchen, flat-screen TV, comfortable seating, a billiards table and more. Additional resident perks include Valet Living - doorstep trash pick up, onsite recycling, car care center, WiFi in all common areas and access to our executive business center with a multi-functional printer. We love our Camden pet friends, and they're sure to love our brand new Bark Park too! 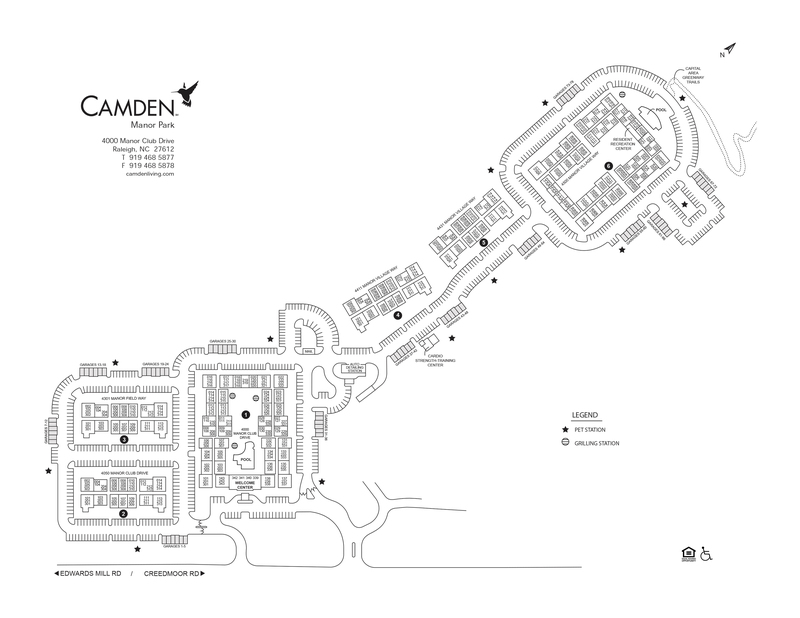 We welcome you to come home to Camden Manor Park - call us to schedule a tour today! At Camden, your pets are family too! We welcome cats and dogs, up to three pets per apartment home, with a full-grown maximum weight limit of 100 pounds combined. Call us with any pet-related questions! Detached garages are available for $115 per month. Call us for details on any specials we might be running!